Getting the accountability system right in the beginning is foundational to the organization's success through the year. The Leader Evaluation Manager® helps leaders understand the key items they are accountable to achieve and which of those are most priority. This tool allows for a centralized place to track and manage the important components to take accountability to the next level within your organization. Learn more in this 3-minute video by Studer Group Solutions Expert, Kelly Dickey. Senior leader visibility and simplicity are the power of the Leader Evaluation Manager®. Evidence shows that organizations are most aligned when leaders are accountable for metrics or outcomes versus simply tactics or behaviors alone. Consistency is key! As consistency grows, so does engagement. This does not "just happen". Organizations make it happen by ensuring that all employees get the same leadership experience, practice the same evidence based tactics, and are held accountable to the same behavioral standards. The Validation Matrix is designed to automate and centralize the "always" execution of essential Evidence-Based LeadershipSM behaviors we know are linked to our ability to drive outcomes. As a component of your current Leader Evaluation Manager® application or as a standalone product, the Validation Matrix is used to enhance the process of reviewing performance within the context of the Monthly Meeting Model. The primary goal of this is to take alignment and accountability to the next level! Watch this short 2-minute video to learn more. Download the Leader Evaluation Manager® product sheet. Provides robust reporting on compliance which drives outcomes. Insight: Are you holding leaders accountable for only 1/8 of the HCAHPS pie? 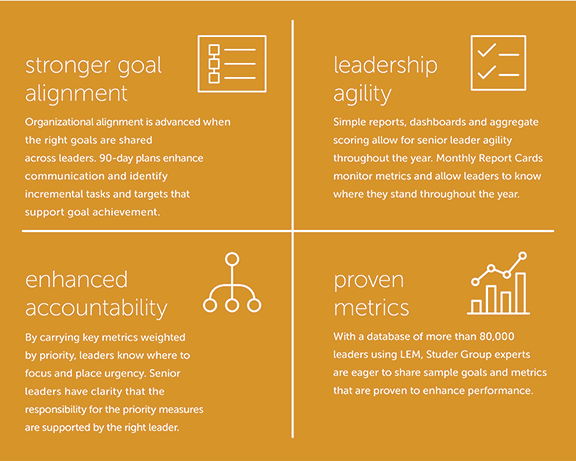 Enhanced alignment and accountability across the entire organization starts with the Leader Evaluation Manager®. Complete the form to get started today.